Volcano is an Icelandic film which lasts an astonishingly long 95 minutes. Slow-moving, to the point of inertia or catatonia, the laboured production agonisingly felt much longer than many movies with much more substantial running times - Fanny and Alexander breezes by in comparison. Theodór Júlíusson stars as Hannes, a retired janitor who faces an uncertain future, practically estranged from his wife and with an open resentment of his daughter's career as a loans manager in a bank. Whilst Henry David Thoreau once noted that "Most men lead lives of quiet desperation and go to the grave with songs still in them", Hannes, a dormant ball of unrefined bitterness, clearly wants to relieve himself of the melody of existential malaise before departing life. What can he commit his last few years to so as to add meaning to his final chapters? Whilst Volcano could refer to the eruption which displaced a young Hannes from the island of Vestmannaeyjar to mainland Iceland, the title could be equally applied to Hannes himself. Cantankerous throughout, its not a spoiler to suggest that at some point he will explode - but will he do so out of love or anger? Or, perhaps, a combination of the two? Although Volcano deals with some pretty weighty topics, it does so in a weightless fashion. 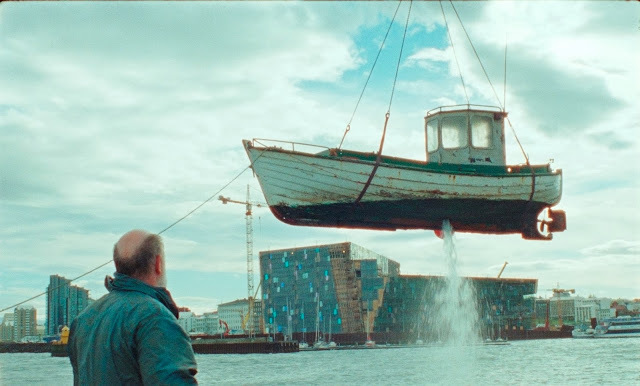 Rúnar Rúnarsson's movie drifts by like a rudderless craft - at one point Hannes takes a fishing boat to sea which soon springs a leak; its almost a post-modern metaphor for the feature as a whole. Whilst the scenery is nothing short of magnificent, it would take a very talented cinematographer indeed to besmirch the aesthetic pleasure of Iceland, the film as a whole is rather aimless and spends a long time not getting anywhere. Ostensibly a realist tale, a la a Scandanavian Ken Loach, the narrative arc likes any degree of refinement or agency; meandering events occur one after another until a brutal act attempts to stir the audience from the early onset of petrification. As a final note, I must state that I am clearly in the minority view of this production. Volcano has won awards from around the globe (including, somewhat confusingly, the Best Film award at the 18th Bradford International Film Festival) and some rather fantastic write-ups too. Trust everyone else or trust me.